To kick things off, here is one cocktail recipe that you certainly don't see every day. 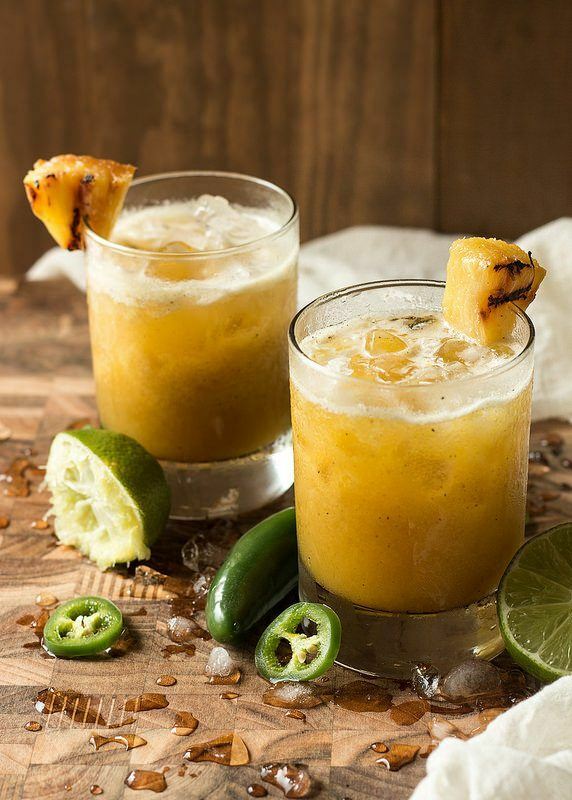 The recipe relies on strong flavors from the pineapple and the jalapeno. The creator promises that those two flavors do work together well and that the whole cocktail is a great balance of flavors. 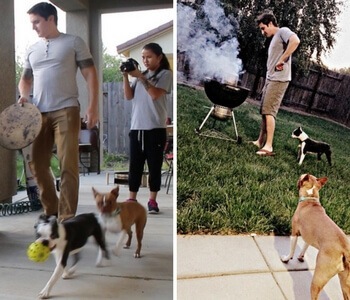 If you want to know for yourself, you'll have to head on down to willcookforfriends.com and check the recipe out. The author does also offer a few substitutions to tweak the flavor if the standard recipe doesn't match your palate. I love white chocolate, but people almost always choose milk chocolate instead. 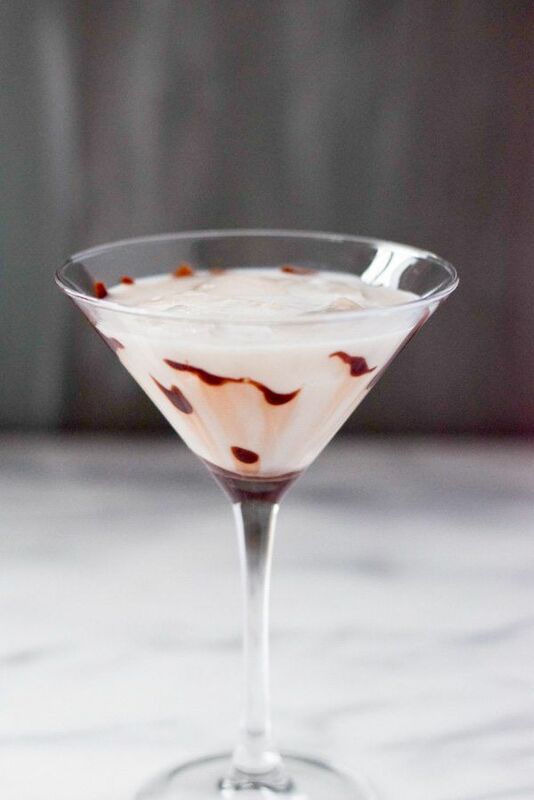 I found this recipe at dishesdelish.com and it really is a wonderful example of using white chocolate in a cocktail. Besides that, the ingredients chosen make the entire recipe sound just perfect. This is one cocktail that I'll be giving a try myself. This recipe entirely takes its inspiration from a peppermint hot chocolate, which isn't a bad thing. In fact, hot chocolate mix even graces the ingredients list, so you know exactly what you are in for. I really love the idea though, because hot chocolate really does taste wonderful, so why not use those same flavors in a cold cocktail? You can find all the information that you need for this recipe at thecookierookie.com. As flavor combinations go, this recipe is certainly one of the more unusual ones, but that's not a bad thing. 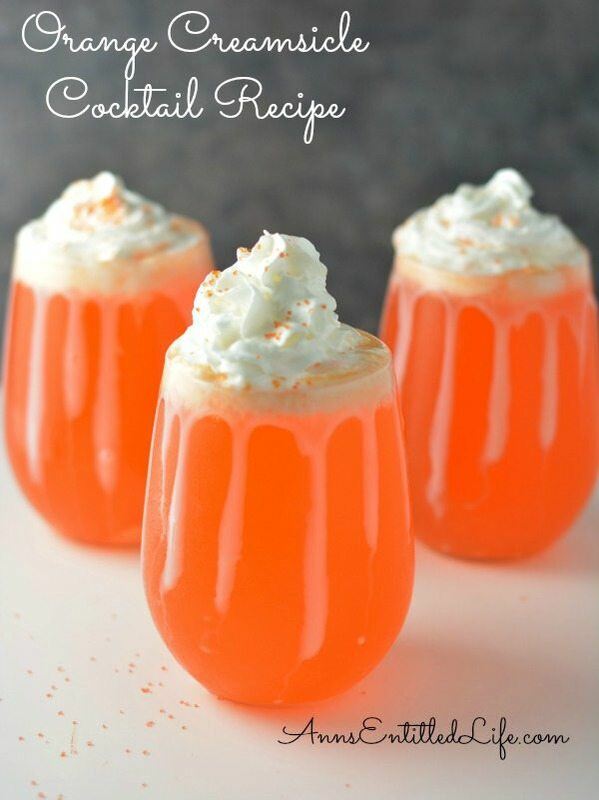 With this recipe, Jennifer noted that she was specifically looking for a drink that was a bit girly and a bit fizzy, and the end recipe does meet both of those aims. The recipe is also a little unexpected, so you'll have to see the recipe over at pastrychefonline.com to truly know what to expect. 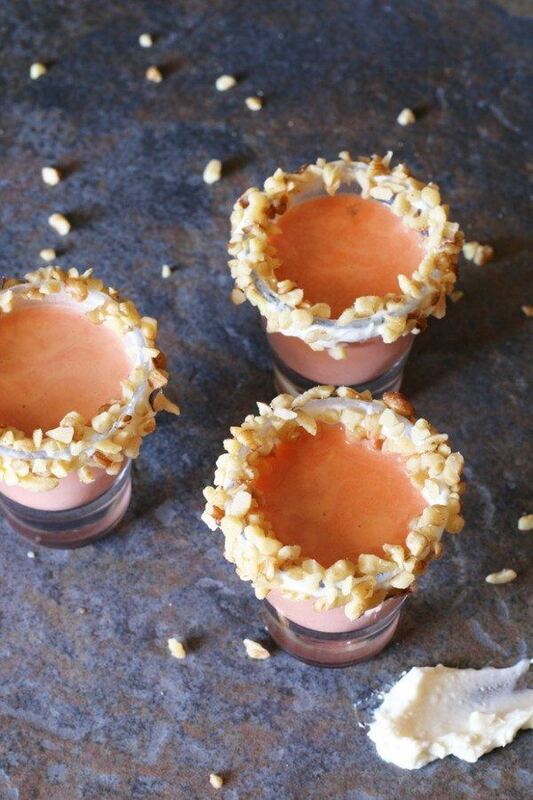 We can't have a list of food-inspired drinks without including at least some shots in there. This one drew its inspiration from carrot cake, although that's fairly obvious just by looking at it. The combination of ingredients would make this drink taste pretty close to the real thing, which is an impressive feat. It might even appeal to people who aren't that keen on carrot cake. If you're interested, you can check out the full recipe at cakeenknife.com. 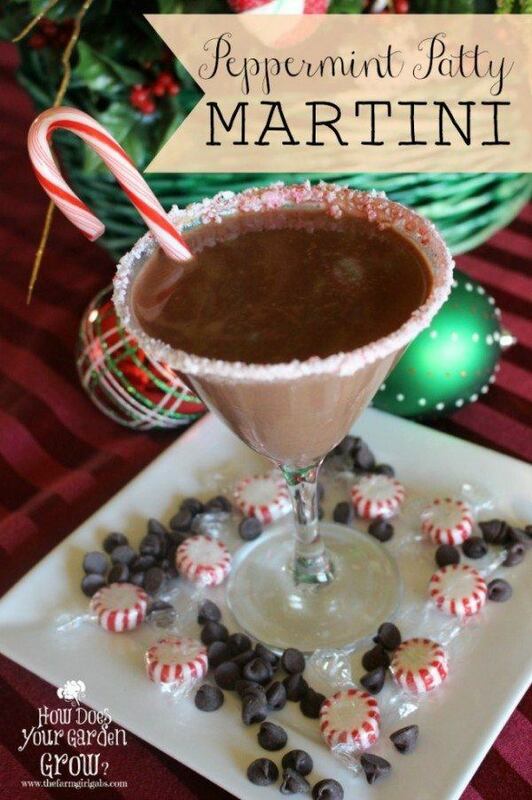 This cocktail comes from thefarmgirlgabs.com and perfectly combines the flavor of chocolate with peppermint and vanilla. I've seen this type of cocktail in the past, but this is one of the more complex recipes. That's a good thing though, because this recipe uses an interesting combination of ingredients that would make the recipe that much more appealing. I also really love the choice of rim for the glass, as that just ties the whole thing off. With this cocktail, you have two food flavors (grapefruit and basil), which aren't paired together all that often. 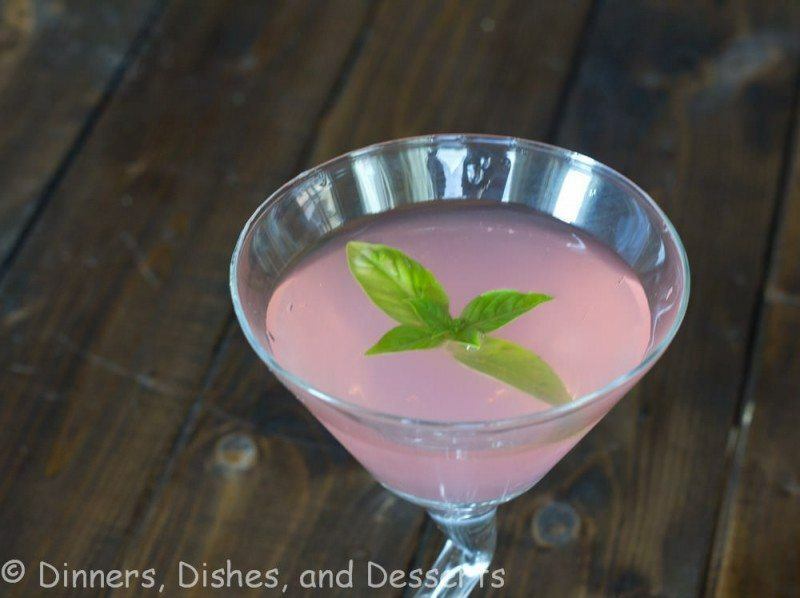 The cocktail is a very simple one to make, and the color would make it a good choice for summer. Even in winter though, the cocktail would still be appealing. After all, alcohol does tend to warm you up. In this case, the recipe comes from dinnersdishesanddesserts.com. This recipe manages to look like, and taste like, a creamsicle – so it's as food-inspired as they come. I also love the way that this looks in the glass. After all, bright orange cocktails are a rarity. 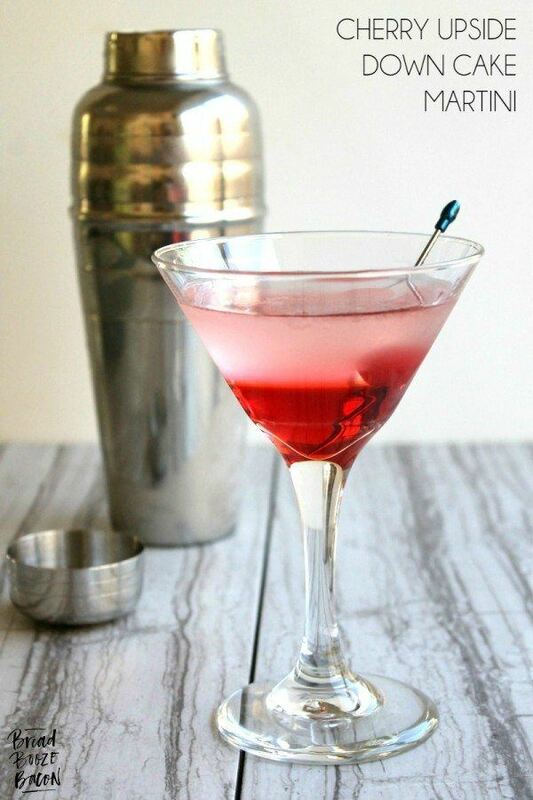 This recipe came from annesentitledlife.com and it seems like a cool cocktail for anyone who wants something a bit different. Or anyone that loves creamsicles, of course. Cinnamon and candy apples are mainly Halloween flavors, but who says that it is limited to that time of year? This cocktail is great, because it's a fashionable way to get those flavors regardless of whether it is summer, winter, spring or fall. Plus, the color in the glass is just too good to pass up. You can find all the information you need about this recipe at girlinthelittleredkitchen.com. The name of this recipe alone should give you a good idea about the food that inspired it. To me, this particular cocktail looks like an adult version of a vanilla milkshake and in some ways that isn't far off the mark. 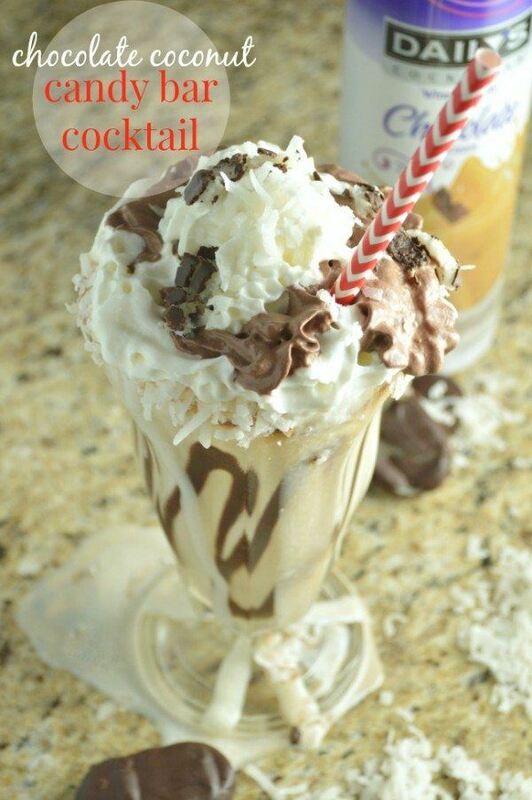 I love the way that Heather, from sugardishme.com, calls this recipe a combination of drinks and desserts, because it so totally is. Of course, the downside is that you probably shouldn't have more than one of these extravagant drinks. 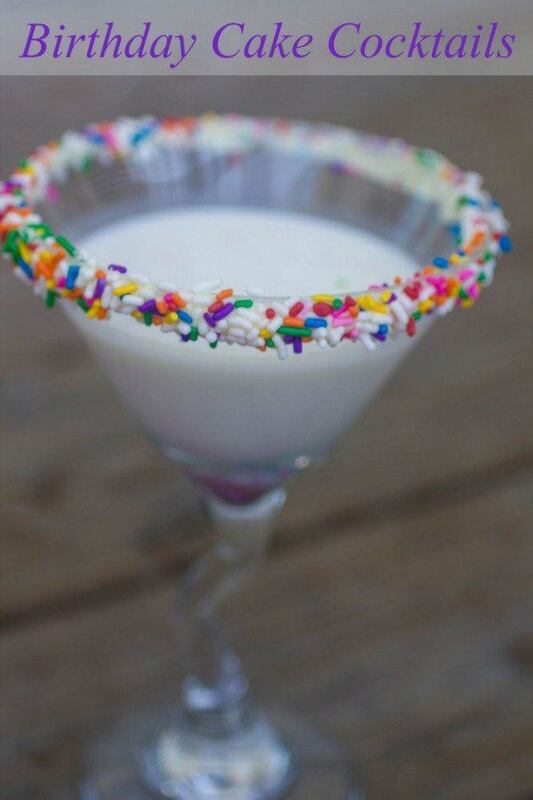 As you can see, this cocktail takes its flavor inspiration from birthday cake, because why not? I love the sprinkles on the rim too. To me, those are what makes the drink stand out. Otherwise, it would kind of look like a vanilla cocktail. Regardless, this is a great recipe to try for anybody's birthday and you can find all of the details at dailydishrecipes.com. So far, most of the food that has inspired these cocktails has been sweet, but this cocktail is a bit different. 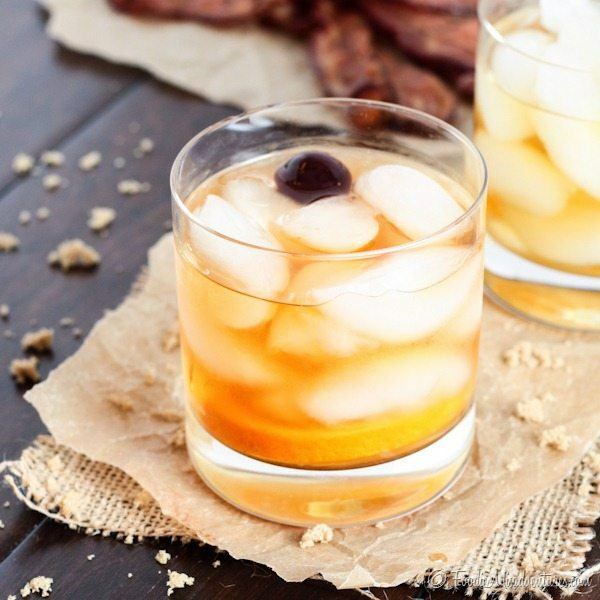 One of the key flavors with this cocktail is bacon, which results in a smoky taste that would actually go really well. Besides, with so many bacon lovers out there, having bacon flavoring in a cocktail is a great idea. The recipe comes from foodiemisadventures.com and the author also links to her recipe for bacon infused bourbon if you want that instead. 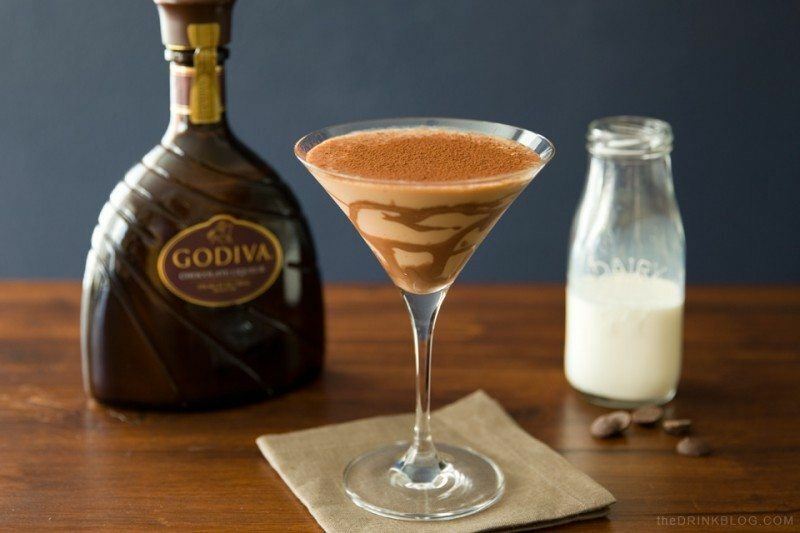 Needless to say, chocolate is the food of choice with this cocktail. 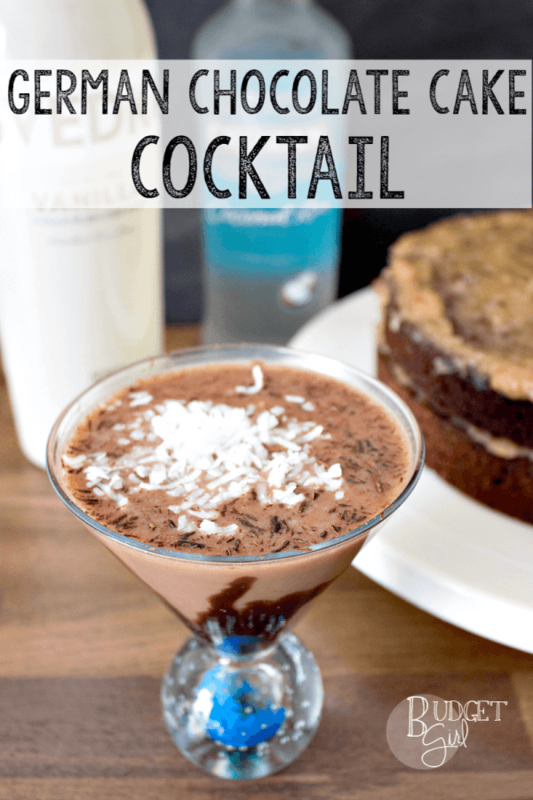 In fact, most of the ingredients in this cocktail are chocolate flavored to some degree or another, so you end up with an intensely chocolate drink. As usual, you can find the recipe at the site it came from, which in this case was thedrinkblog.com. Cherry poke cake is the food behind this cocktail, as you might have guessed from its name. I love the bright color of the cocktail, which makes it seem like a perfect fit for summer. 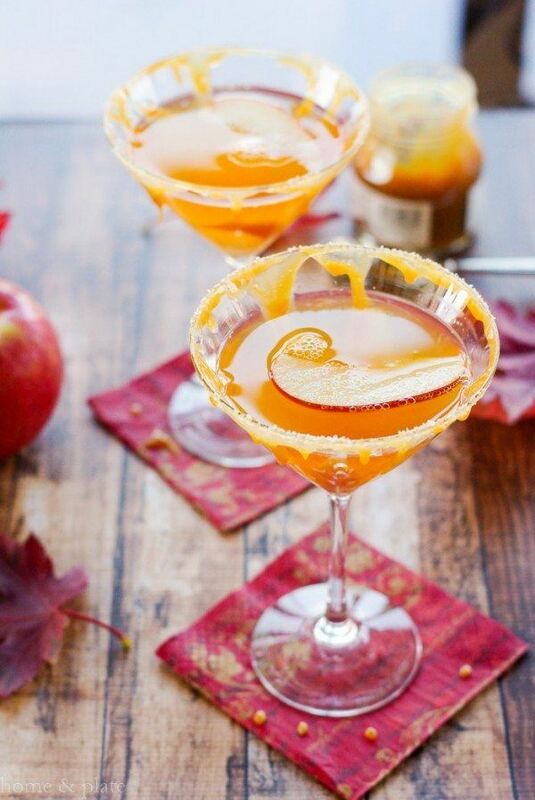 Realistically though, this cocktail would be just as appealing in winter. You can find the recipe for this one at realhousemoms.com. 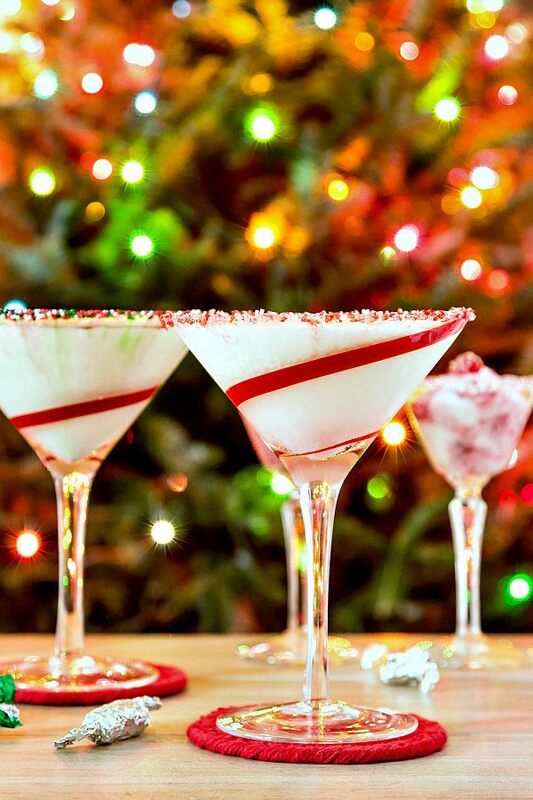 Here is a pretty seasonal example of a food inspired cocktail and in this case the inspiration is definitely candy canes. 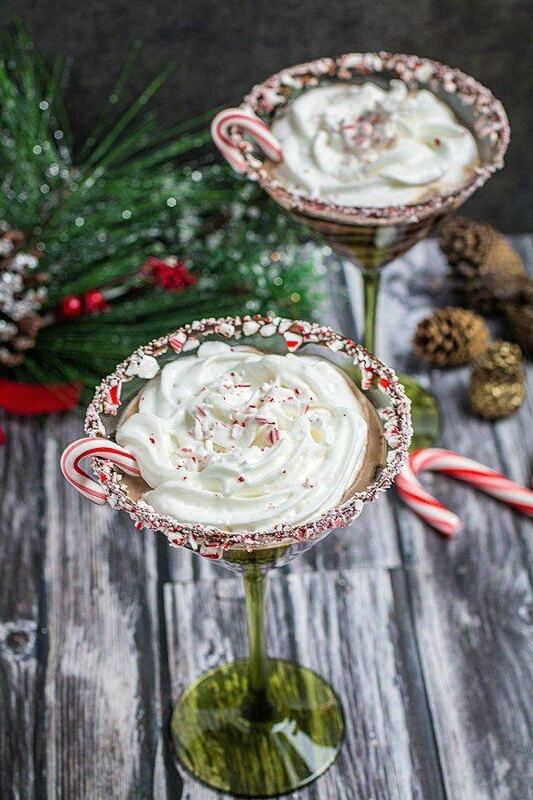 Even if you're not a big fan of candy canes, I'm sure that this cocktail would win you over. 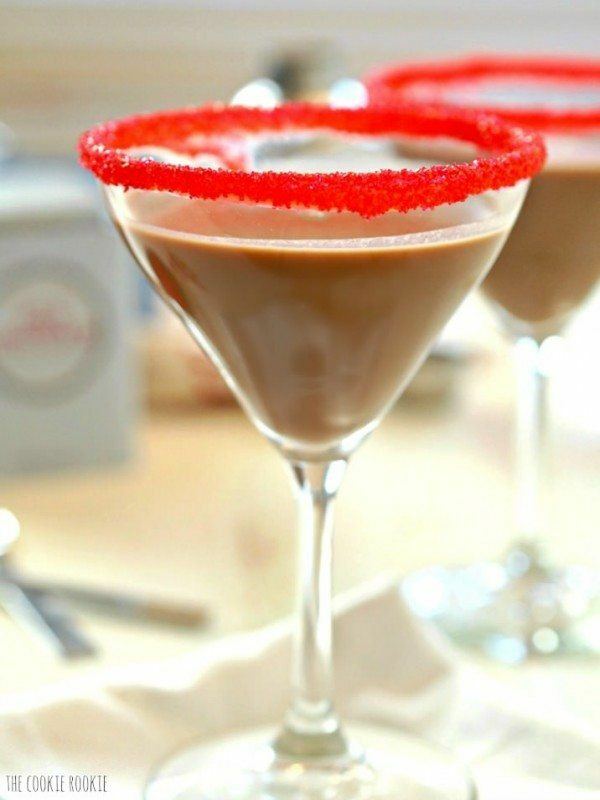 You could also make it without the candy cane and chocolate rim if you were inclined. Either way, you can find the recipe at peasandpeonies.com. A warm apple pie is such a traditional dish, but it doesn't necessarily have to come in pie form. 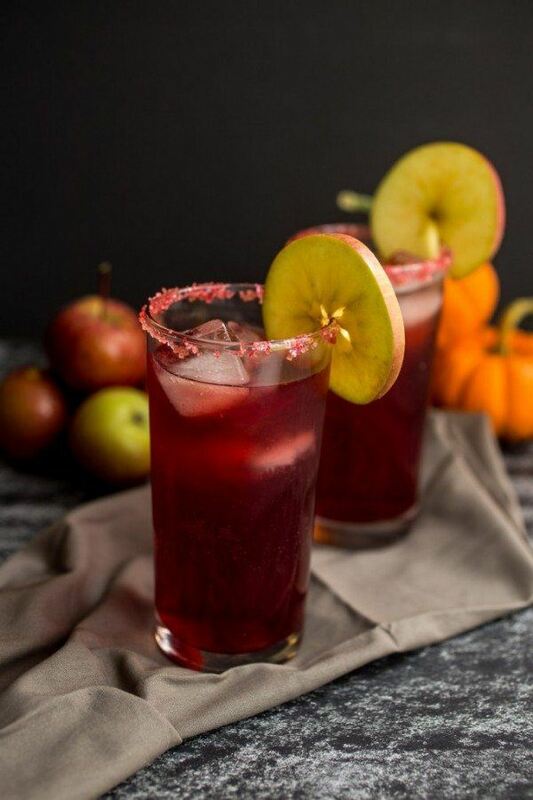 This particular cocktail really does have the colors and the flavors of an apple pie. That would make it a great warmer for cold winter evenings or for holiday celebrations. It's also a warm cocktail and you can make a batch of the cocktail, which again, is perfect for celebrations. If you want to try this one, it's hosted over at missinthekitchen.com. 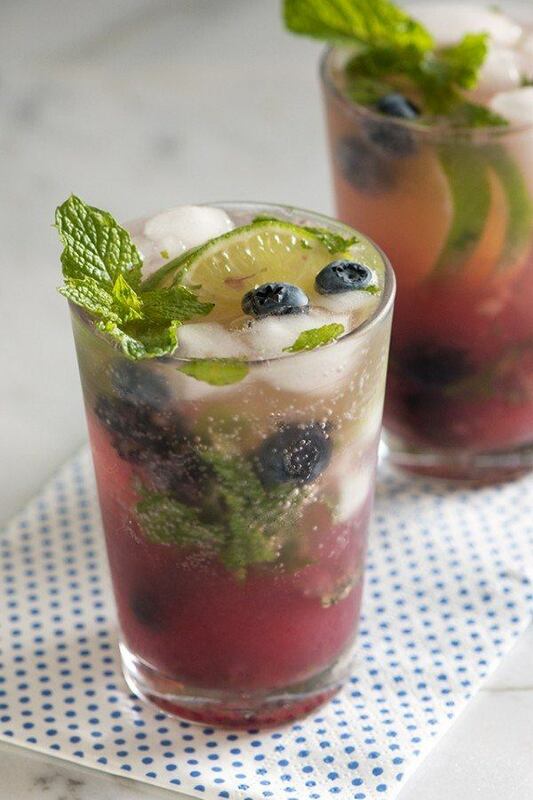 This mojito is full of food flavors, including the classic peppermint and lime. The twist here is the inclusion of blueberries, which would quite significantly alter the taste. It also makes the entire thing look much more interesting in the glass. The recipe comes from inspiredtaste.net and is worth checking out. 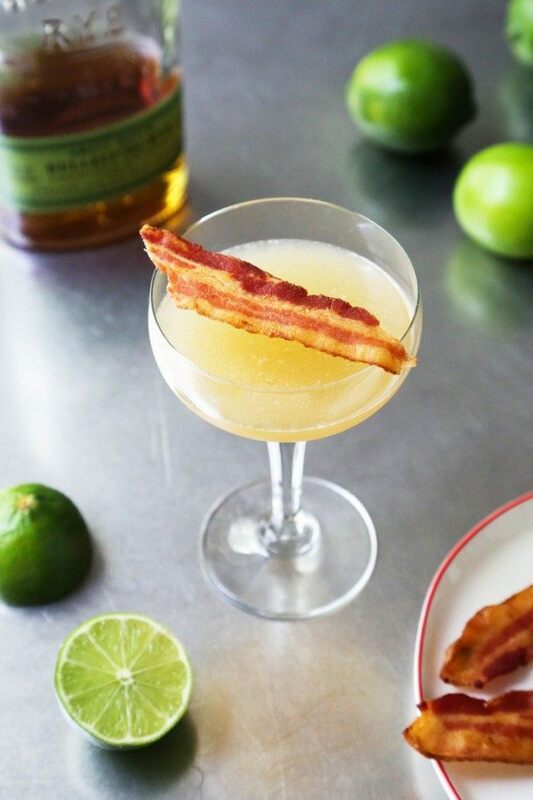 Here's another cocktail that offers bacon as part of the flavor and the recipe comes from kitchenkonfidence.com. Bacon might be an odd addition to a cocktail, but there's no reason why the flavor wouldn't work out well. In fact, the author even points out that savory cocktails in general can be quite popular. This recipe is relatively simple, so it's a great one to try if you are a little hesitant about putting bacon in a cocktail. With this martini I offer up another interesting flavor combination. Salted caramel has certainly been a popular flavor in food, but it doesn't make its way over to cocktails all that much. Nevertheless, this recipe does a great job at combining both flavors into something unique and appealing. I found the recipe at homeandplate.com and was immediately captivated by its appearance. 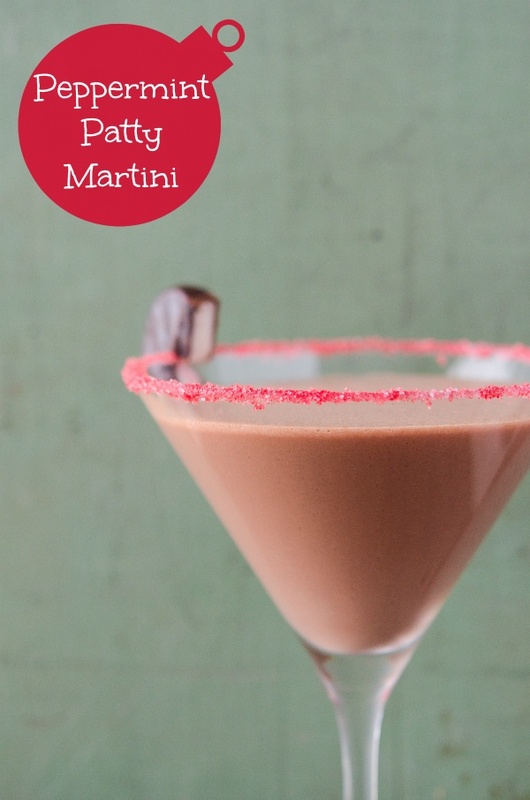 Mmm… this is a great cocktail for chocolate lovers. The key flavor is, of course, chocolate but there is also an underlying flavor of coconut and vanilla. Those flavors bring the whole thing together nicely and make it taste a bit more interesting than it would otherwise. If you're interested in this one, the recipe is hosted at diybudgetgirl.com. As far as drinks go, this one is a bit unique but very fun. 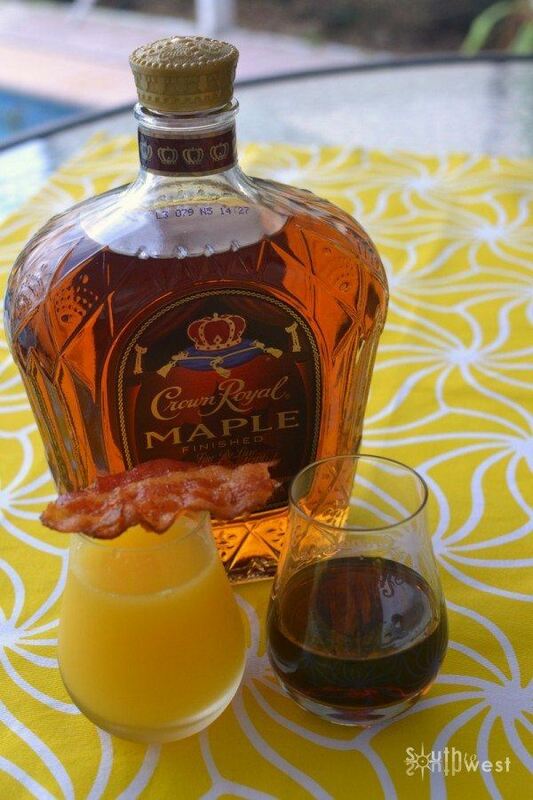 Basically, it is a maple and coffee shot, which you follow with orange juice and bacon as a chaser. So, the drinks aren't inspired by one specific food, but by the concept of breakfast in general. See? I told you it was fun. If you want a look you can find the recipe at southtosouthwest.com. Lemons often add some complementary flavor into a cocktail, but it's rare to find them as the feature ingredient. 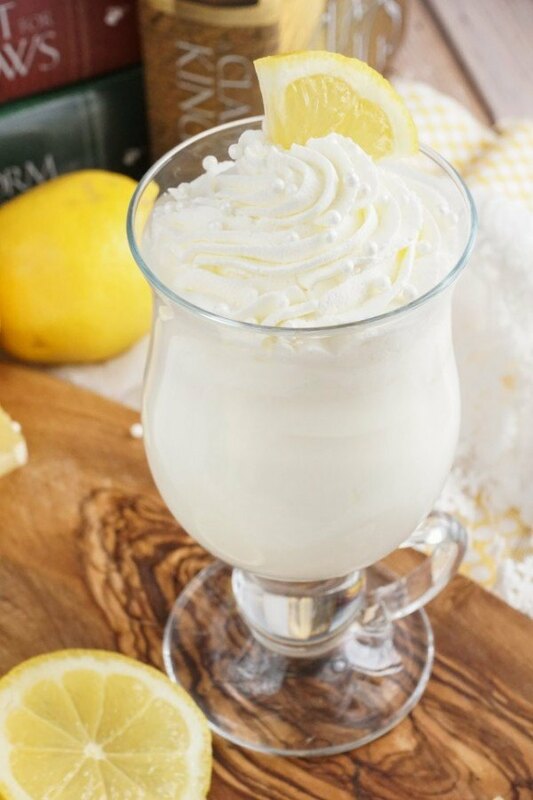 The name for this dessert refers to Sansa from Game of Thrones and the dessert from the show so perhaps it isn't surprising that the cocktail features lemon so strongly. This cocktail also has that kind of frozen slushy texture, which also makes it a bit unique. This time, the recipe is hosted at sugarandsoul.co and I seriously recommend checking it out. 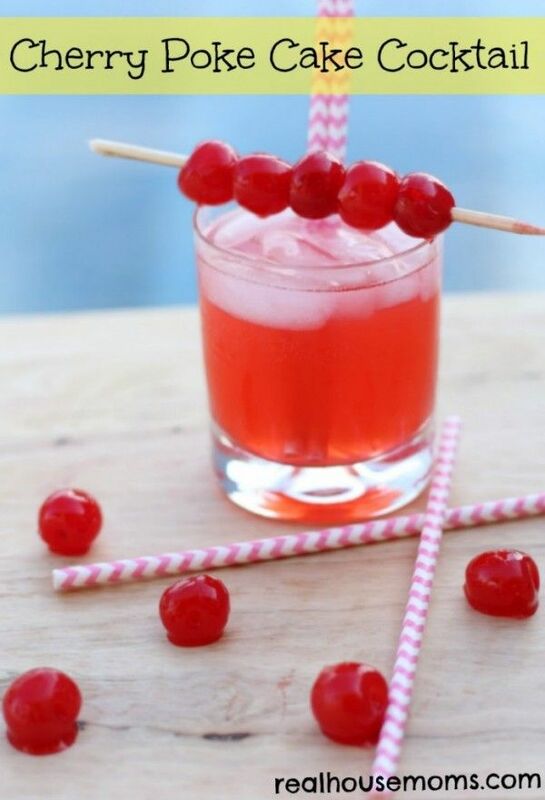 Here is another cherry-themed cocktail, this time based on cherry cake. The color scheme of the drink is also a bit of fun and would make them stand out if you were serving the drinks to friends. I'm sure the cocktail would taste as good as it looks. The recipe comes from breadboozebacon.com and there are also many more cocktail and shot recipes on her site to have a go at. 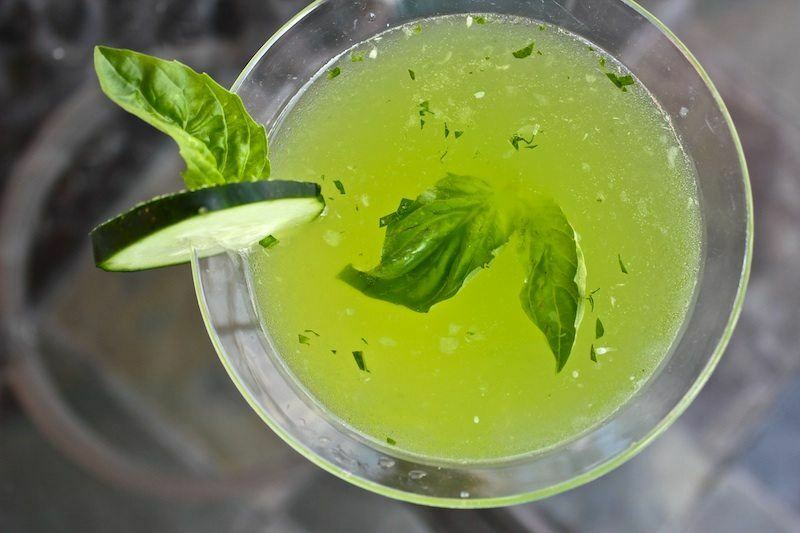 Cucumber and basil tend to be flavors that you find in salads, but this cocktail recipe is another great way to use them. This cocktail would have an advantage over many as it wouldn't end up being too sweet. Instead, the flavors would be quite refreshing, especially on a warm day. You can check it out at fromthelittleyellowkitchen.com. This particular recipe comes from thenovicechefblog.com. Despite the name, it isn't actually inspired from peppermint patties. Instead, that is actually the name used for this type of cocktail. Nevertheless, it does still have a similar flavor to peppermint patties (or indeed, anything that uses peppermint and chocolate), so the recipe certainly deserves a place on this list. 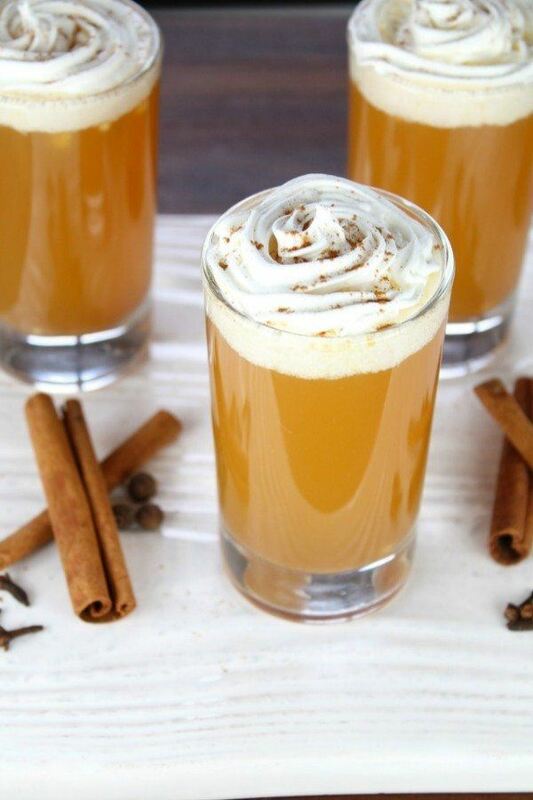 You are here: Home / Exotic Food / 25 Food-Inspired Cocktails That Will Make You Say Yum!